The Hack Attack Pad Perch, designed by B.A.S.S. Elite Pro, Greg Hackney, is based on the design of the KVD Popping Perch but with a pointed nose to come through thick cover easier, such as lily pads and brush. The bait skips, walks, and splashes like a wounded perch. It features a big strong double hook and easily collapsible sealed body for good hook ups and combats against leaks. 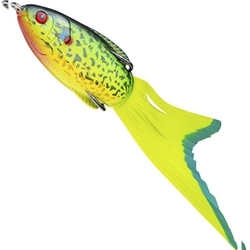 The Hack Attack Pad Perch is the NEXT level in the liveliest hollow body lure design EVER!